The above info came from 411, and was edited by yours truly (contact me). The image came from Amazon.com. 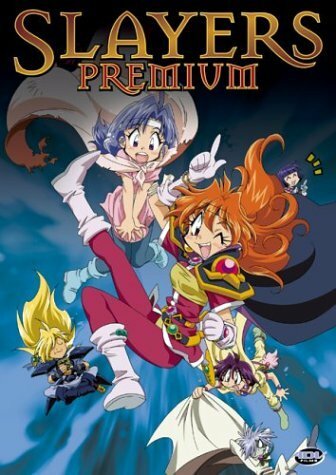 Slayers Premium is the sequel to the third season of the Slayers TV series called Slayers Try . When Lina, Gourry, and the rest of the gang go to a seafood village, they think it is time to just hang by the seaside. They don't realize that some action is about to begin! At a restaurant, Gourry eats an ikasu octopus, not realizing it has demonic powers... if someone eats an octopus with these powers, they can then only speak in octopese! Thus, poor Gourry starts speaking in that bizarre language. Rumma comes into the restaurant and explains to Lina that Gourry is speaking octopese, and she offers them a place to stay at night. Then our other heroes, Zelgadis and Amelia start to speak octopese as well. Now it's up to the Slayers to save everyone who's now speaking in octopese! Can they do it before the enemy guardian Diety awakens? And what about the octopus sorceress? You have to see the movie to find out! The above description came from 411, and was edited by yours truly (contact me). The cast of the Slayers TV series reunites in an OVA adventure which in places can be hard to digest... in more ways than one. The octopus fished in the town of Acassi is cursed. Whoever eats them is cursed to speak the language of all octopi. Lina Inverse and Gourry Gabriev, after a hard day of fishing in that area, have a dinner with fish from that town... including the octopus! And somehow, the dim-witted swordsman had ate one of those octopus. Now he's speaking a lot of nonsense... and it's spreading! Lina has to find the cure of what everyone is speaking.... and to find out what Gourry is saying.